After understanding what Mod Slicing does and why it is beneficial, let’s explore how to slice mods. 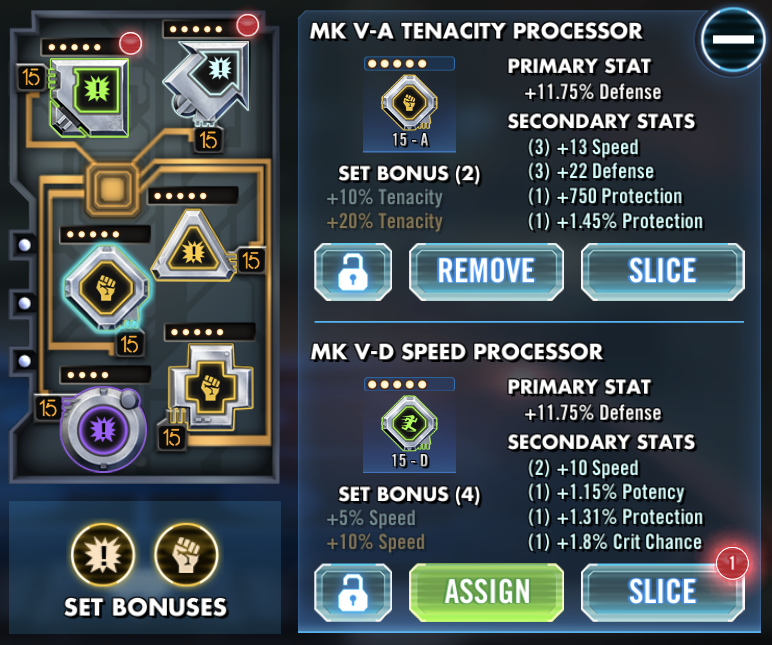 All 5* can be sliced once the relevant Mod Salvage is available. Once a mod is ready to be sliced, a red dot will appear at the corner of the mod, indicating that the mod can be sliced and also that the needed salvage has been acquired. To slice a mod, select the mod (whether or not it is currently assigned to a character) and select the Slice button. The Slice button will always be available as long as the mod can be sliced, but the Slice button will only display a Red number when the mod is fully ready to be sliced. 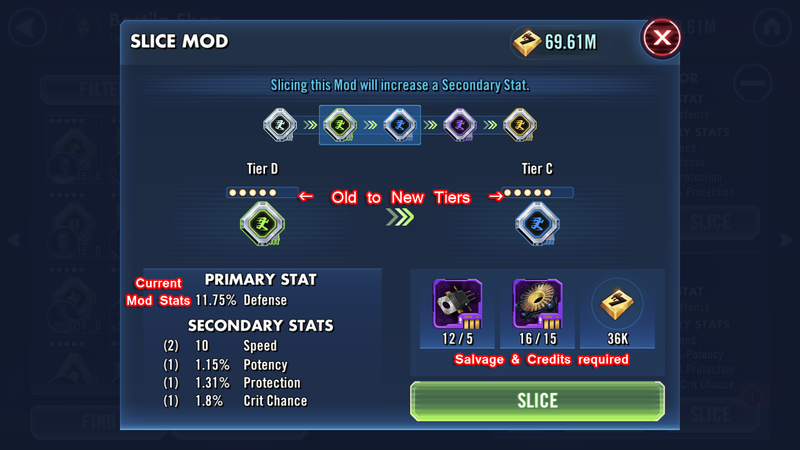 To fully slice the mod, select the Slice from the Slice Mod screen. 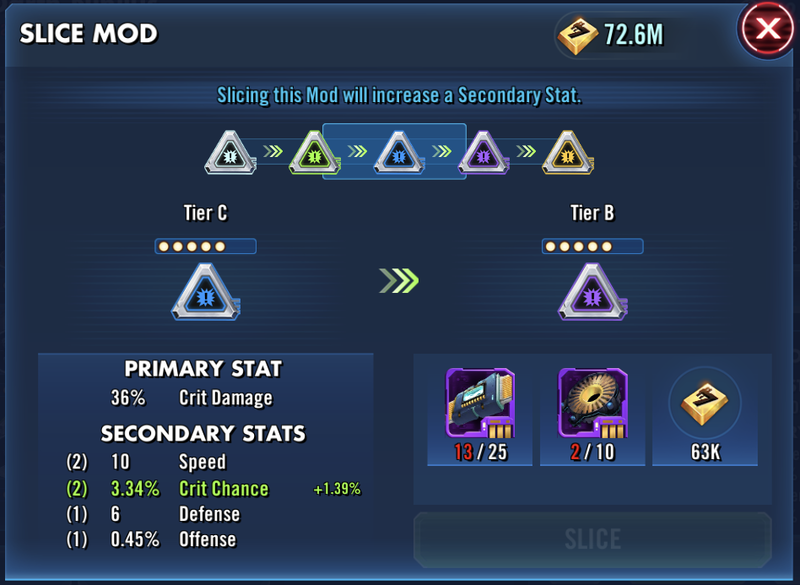 The required Mod Salvage and credits will be deducted and the secondary stat that increased will flash green and will show the respective increase. If the Mod Salvage and credits are available, mods can be sliced straight from 5E to 6E. In order to slice each mod, specific Mod Salvage and credits are required for each Tier increase. Mod Salvage are acquired through Mod Battles Stage 9 battles and the Mod Salvage used to go from 5A to 6E is acquired through the Guild Store.